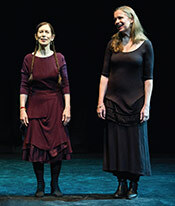 The Greenberg Distinguished Scholar Program is pleased to bring internationally acclaimed composer, singer, and director/choreographer Meredith Monk to campus. Regarded as both a “magician of the voice” and “one of America's coolest composers,” Monk is a pioneer in what is now called extended vocal technique and interdisciplinary performance. In an effort to discover and weave together new modes of perception, Monk creates works at the intersection of music and movement, image and object, and light and sound. This performance with Meredith Monk and Vocal Ensemble member Katie Geissinger reflects Monk's profound understanding of the voice’s flexibility and expressive depth. Celebrated internationally, Monk has had her work presented by BAM, Lincoln Center Festival, Houston Grand Opera, London’s Barbican Centre, and at major venues in countries from Brazil to Syria. Among her many accolades, she was named 2012 Composer of the Year by Musical America and one of NPR’s 50 Great Voices. She received New Music USA’s 2013 Founders Award, a 2011 Yoko Ono Lennon Courage Award for the Arts, and a 2012 Doris Duke Artist Award. Geissinger has been touring with Monk since 1990 in concert and in pieces such as ATLAS, the Politics of Quiet (for which she is a “Bessie” recipient), mercy (with Ann Hamilton), impermanence, Songs of Ascension, and On Behalf of Nature.